ii) The utter revulsion most people now feel in relation to any kind of residential property (investment). Which is ridiculous – almost as ridiculous as what went on during the whole 2003-07 property boom (mostly in the Anglo-Saxon world). People have completely forgotten residential property’s normally a genuinely safe, but relatively low return, investment. Yeah, seriously! Property’s also a labour & admin. intensive investment. Which makes it all the more bizarre to see it nominated as the inevitable third choice for investors, after cash/bonds & equities. Tip residential property, and people automatically presume you’re encouraging them to buy a house, or two. Nothing could be further from my mind! If you want diversification, economies of scale, better leverage, a better bargain (usually), and far less hassle – visit your stockbroker, definitely not your real estate agent. [OK – why do real estate agents exist? a) Nobody knows, and b) So lawyers have somebody to look down upon!]. The best property investment solution is obvious: Buy a property stock! As you’ll see, point ii) is v relevant when it comes to German property. OK, so – what’s the attraction of German residential property? Like many Western economies, German population growth’s slowed markedly in recent years & decades. In fact, it’s turned v marginally negative in the past decade. There have been encouraging signs of an increasing birth rate in the past few years – but, realistically, this is likely to be counteracted by an increasing death rate. Overall, this has actually been more than offset (again, like many Western economies) by a migration to the cities, a trend towards smaller households, and an increasing demand in floor size per capita. Um, so perhaps they’re right? Er, sure…except 82 million Germans can’t be wrong! Yes, people tend to forget Germany’s sheer population size. It’s the 16th most populous nation in the world, and the largest in Europe. This blindness seems to extend to the city level also. I’ve yet to meet somebody who realizes Berlin (with some of the cheapest property in Germany) is the 2nd largest city in the EU! A 3.5 mio population doesn’t exactly suggest a provincial backwater..! 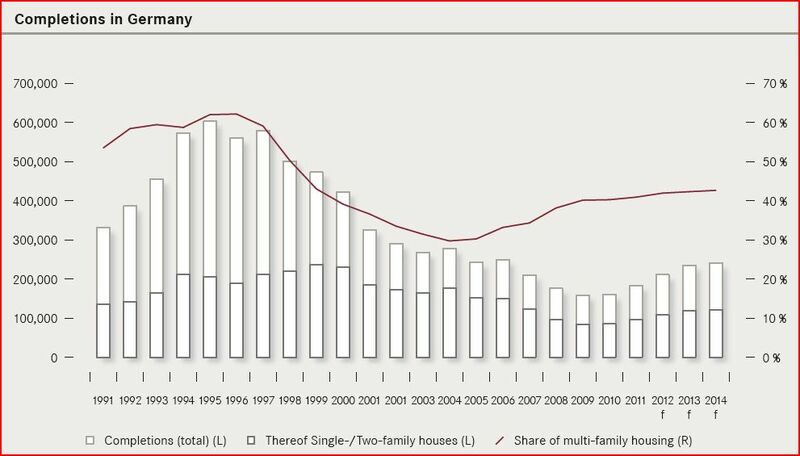 The surge in the ’90s represents the last great property boom Germany experienced (post reunification). Static property values, the gradual withdrawal of state & municipal authorities from housing, and a slow/difficult planning permission process, all contributed to a relentless decline in completions in the 2000s, bottoming out around 175 K pa. This compares to an actual housing demand of about 250 K, perhaps even 350 K pa. Housing permits are now accelerating, but there’s clearly years of catch-up to get through. However, there’s an even more obvious reason for the suppressed rate of completions: Germany’s one of the few countries where second-hand property prices have traded (on a medium/long term basis) at a major discount to new construction costs. For example, new building costs in Berlin are estimated to be around EUR 1,200-1,400 per sq mtr, while a substantial % of its existing housing stock’s valued at (& can be purchased at) about EUR 900 per sqm, or less. Home ownership in Germany’s currently estimated to be a lowly 46%. This stands in stark contrast to most Western markets, which generally have home ownership rates of 60-65%+. At first glance, this is surprising, considering Germany’s relatively high 10-12% savings rate – which you’d expect to be supportive of & directed towards higher home ownership. However, it does illustrate the response of private citizens to government intervention (albeit, v differently than the disastrous results of policy in the US, for example!). In the past decade, the authorities have been increasingly disengaging from this type of intervention & financial commitment. Fortunately, this has proved a boon for investors, as it’s created a whole new generation of property companies. Selling municipal housing (primarily, apartments) on a wholesale basis to residential property investment companies has proved to be the only fast, simple & financially clean method for authorities to achieve this pressing objective. It’s also permitted a higher level of annual rent increases to be now achieved. This has all been, of course, a source of strong debate & interest for citizens, but ultimately it creates an ongoing distinct bias/pressure towards an increased rate of home ownership. Taken together with increasing (private) investor aversion to (European) equity markets, prolonged low interest rates, and the eventual threat of higher inflation & lower entitlements, this seems to virtually guarantee a slow but sure convergence in ownership towards other Western countries (who will perhaps be slowly moving in the opposite direction). This offers another source of increased buying demand in the German market. Demand which is particularly attractive, as it offers German property companies the opportunity to sell residential units at a much higher retail price level, albeit in a slow & steady fashion.